Queens Park Rangers are to gift naming rights to their Loftus Road home to a charity from next season and have asked supporters to choose the cause. It will be the first time the ground will be known by a different name. Supporters of the London side have been asked to nominate charities which have strong local connections to the club's base in Shepherd's Bush. Chief executive Lee Hoos said it will "help a charity get exposure they would never normally be able to achieve". In a statement, he continued: "There are so many worthwhile causes out there who do incredible things, so the next question was how we decide which charity to work with. "Consultation with fans is something that I have always believed in, and so it makes absolute sense to let the supporters make that decision." Naming rights are often a lucrative source of income to clubs who choose to sell them, with Premier League clubs pulling in tens of millions of pounds, while League One club Peterborough recently agreed a 10-year deal worth £2m, which will see their ground renamed the Weston Homes Stadium. Rangers have asked fans to consider the impact the charity they suggest has on the community, how the cause will "benefit from broader recognition" and if it has "appropriate internal infrastructure" to capitalise on any increased awareness. 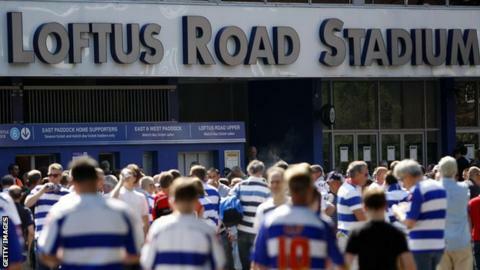 QPR, who have played at Loftus Road for more than 100 years, have set a 3 May deadline for nominations. After that a shortlist will be agreed, with supporters then given the chance to vote for their preferred choice.